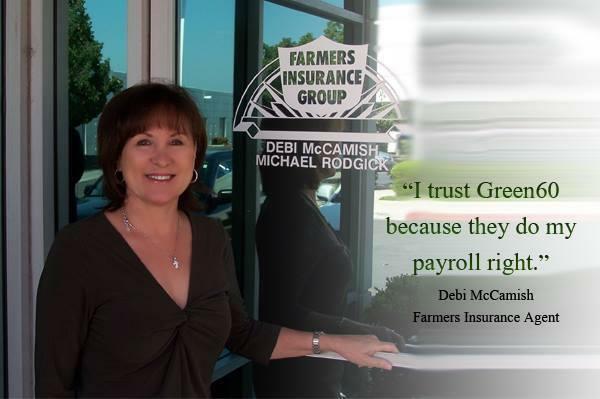 Debi McCamish of Farmers insurance uses Green60 payroll services! that employees are happy and your stress levels are at a minimum. Not knowing something is not any fun… especially when it comes to our finances. Do we have enough money to pay our employees? What went out? What is left? So many questions. If you outsource the payroll make sure you have access at your fingertips to all the reports and employee status. Today a few companies are leading the way in APP development to help employers process payroll from their phone, computer or ipad. Outsourcing is a great idea but not having access to vital information is not. Make sure you are in control even when others are processing your payroll. Today we are seeing a push to automation. While this can be great… it can also be frustrating when you need help and can’t talk to anyone. At Green60 Payroll you get access to live reps to help you with all your payroll needs. The last thing you need when dealing with apps, computers and ipads is not having access to a live person when you need it. If you shop around for Payroll services take a moment and look into Green60 Payroll. We offer top of the line service at the most affordable rate in the industry. We have great clients like Debi McCarmish who uses Green60 Payroll to streamline her payroll needs.